On the morning of May 25th, the Missing Children’s Network commemorated International Missing Children’s Day by holding a press conference at Pierre Elliott Trudeau Elementary School where we proudly announced the creation of SIGN4L, an application that can save the life of a child. The development of this app was made possible thanks to a generous grant by TELUS. 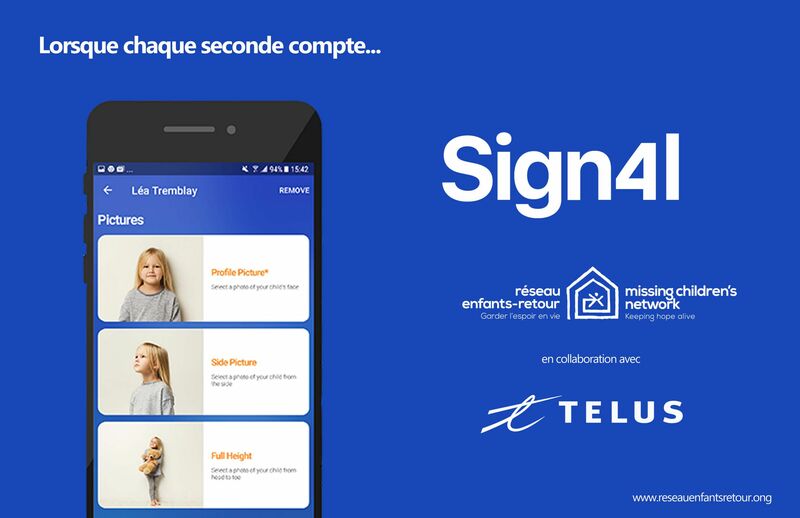 SIGN4L is now available free of charge on most Apple and Android smartphones as well as tablets, and allows users to store up-to-date photos and vital physical descriptions of their child which they can then instantly email or text to the relevant authorities, allowing them to save time in the event of an emergency. The information that will be saved by parents on their child is not stored in any database. Only parents or guardians will be able to access their children’s data sheet. Parents can also rely on the reminder function, which varies according to the age of the child, allowing them to update their child’s profile at any time in the application. SIGN4L also includes safety tips for children as well as the 4 crucial steps to follow in the moments following the disappearance of a child.